We will review your personal goals and map our which Quest Studio Classes will set you up for success. Together we will help you develop a routine that works best for your schedule and current lifestyle, along with an accountability system. You want more than just a coach – how about a PARTNER. With Quest KickStart over your new journey we will partner with you to help you lay the foundation for success. It takes 21 days to create a habit and your Quest Partner will ensure good habits happen. 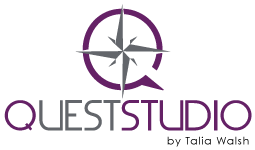 All Quest Studio staff are invested in you – you get your coach and more. The robust community will make you feel welcome and motivated. For those doing Quest KickStart, with a free friend-pass you can share your quest for fitness and health with others and bring a friend! Take a look at our upcoming Nutritional Workshops!